This is THE guy we have picked to match with our Avatar girls. We chose Toledo from Magical Farms' crop of weanlings in 2003, and he has show exceptionally well with the best of the best grays in the country since. He was awarded the Blue and nearly chosen for Reserve Champion at a level 5 show judged by Julio Sumar in 2005. In 2006 Mike Safley commented very enthusiastically about his fleece to his handler at a level 5 show, awarding him a second place ribbon, the first place going to Crescent Moon's ATV Adonnis - one of the most successfully shown gray males in the country. At the same show Toledo was awarded First place and Color Champion Gray fleece in the fleece show. Toledo is jointly owned with our friends, Lynda and Ken Maul, and their partner Christa Cushman, all of Dolores Colorado. Toledo is typey with a gorgeous head and a perfect bite. His fleece character and Density are simply OFF The Charts. The picture of his silver fleece shown here is at 4 years of age - that high frequency crimp just won't quit. The fawn fleece shown is his awesome son Speyburn! His first cria is a bay black male from a fawn dam. Super typey - and wonderful dense soft fleece full of character at just 6 months. His second cria is a bay black beauty that was awarded a second place at her first show, Jude said she missed first "by a whisker". His 3rd cria is the rose gray boy, Deveron, awarded a Blue ribbon at SWRAS. Toledo's 4th and 5th crias are a fawn and silver gray girls. 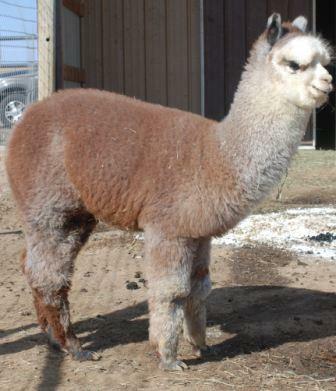 His 6th cria is Speyburn Shadow - a light fawn boy from a light brown dam, with an absolutely breathtaking fleece. See his fleece pic on the right. Speyburn won a second place at the Nationals! 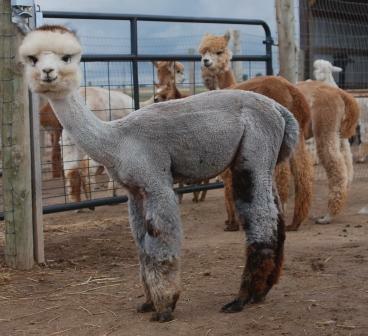 In the light fawn juvenile halter class - competing against those boys from the top light genetics in the country. Our prayers were answered when Orion Grey made his way into this world on Nov 5, 2009. Orion Grey initially appeared to be a beautiful medium rose grey male, who loves nothing more than to kick up his heels and run with his buddies. As he matured, he displays a very fine, high frequency light to medium silver grey. Orion Grey’s dam is Xanadu Chiaroscuro a beautiful rose grey lady whose fleece is exceptionally fine and bright throughout her blanket. Orion Grey’s sire, MFI Toledo, is a dark silver grey with excellent confirmation and exceptional crimp. Even at a very young age, Orion Grey ‘stands out in the crowd’ and we were very excited to introduce him into the show ring in the fall of 2010 where he got a blue and reserve color champion in his very first show. Chimera's Orion is maturing well. He now has his first cria due in the summer of 2014 and we are looking forward to introducing the next generation into the show system as we know it will be everything that we are expecting.